I think I mentioned in a previous post that I started volunteering at a local cat rescue recently. For someone who is becoming a cat lady (apparently any way…it creeps up on you) this is a way to get lots of cat time in without having to go get a cattery permit for my home. Most of the cats are sweeties, and the ones that want to be left alone just stay away. It all works out quite well. Eldest Daughter has been my partner in crime in this new volunteer effort. She takes photos while I write down info about the individual cats. I then write up little descriptions about each adoptable cat that can be put on their website. I bought a special notebook so I can write down all my cat information in one place. When I say “special” I just mean a separate notebook bought specifically for that purpose. It wasn’t expensive or fancy. Eldest and I went to the rescue yesterday. We try to go every Friday. I needed more info on a few of the cats we had visited previously. I somehow hadn’t managed to get everything I needed on the previous visit. We went back into room 5, where the cats live who we needed more info on. Every room there has a few cats that are not adoptable, due to being feral when they came in. They do fine, but just aren’t people cats. On our previous visit, we noted room 5 had a small orange tabby that wanted nothing to do with us. A person who works there told us it had some skin issues that were very hard to treat as the cat was very hard to catch. They were trying, but not having much luck treating little Punky (they give each cat a name). Well, this time, as we walked around, finding he cats we needed more info on, little Punky came up and rubbed against us and let us pet her. I didn’t think anything about it until I looked down and realized it was the kitty who was not catch-able two weeks before. I asked it they would like us to put medicine on her, since she seemed to like us, and they were happy to let us do that. I put my notebook and pen on the shelf that runs around the room, about chest high. Eldest sat on the floor to treat Punky. I decided to go over to the elderly cat room and give them a little attention while she did that. I was over petting old cats when all of a sudden I heard her say, very loudly, “Oh no!” I could tell by the tone of her voice that whatever Eldest was commenting on was not a tragedy. So I started back to ask her what was happening. “Oh No”was right. My notebook ended up in a big bowl of water! I made the mistake of leaving it, my pen, and the sheets with the cats names and photos on it on the shelf. Laying nearby on the same shelf, looking all innocent, was Dagwood, a big orange tabby cat. He decided to engage in some scientific experiments concerning gravity, according to Eldest. First he nudged a list with the cat names and photos off the shelf, and carefully observed the results. Then he nudged my pen off the shelf, and again observed the results, Finally, it was my notebook. Eldest was on the floor, and by the time she realized that the next item to experience gravity was going to go in the water bowl, it was too late. Down went the notebook and once again Dagwood observed the results. Eldest fished it out right away and it is still usable, if a little wrinkled. I scolded Dagwood and then gave him a head scratch. This is an absolutely horrible photo of Dagwood, but it is the only one I have. He is much better looking than this. 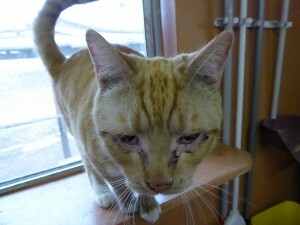 Poor guy was born with some eyelid issues and has cat herpes, which make his eyes run. FYI, almost all cats have been exposed to cat herpes, and it has nothing to do with human herpes. He should be named Newton, for his interest in how gravity affects things! Yeah, they do that when you’re not paying attention. It seems to be fun for the cat watching human stuff fall down. These cats in particular probably don’t get much exposure to things like notebooks and pens, so they are particularly interesting to them. I can’t set my pen down EVER or someone is right there to play with it! I am not a cat lady, don’t think I ever will be, that said cats can make a person happy and leave them feeling good.